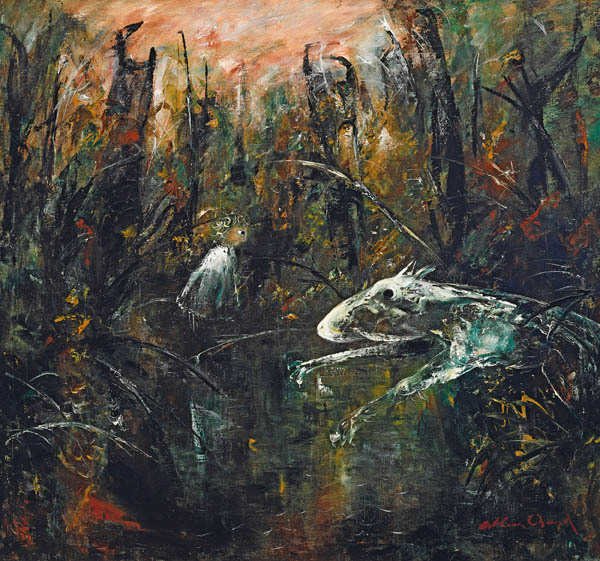 Arthur Boyd had been living in London for seven years when he painted the present work, and his position as a leading Australian artist on the international stage was well established. Following the success of his seminal Brides series in 1958/59, he left for London and continued the long established tradition of Australian artists who travelled to the UK and Europe to study the work of Old Masters, and experience the rich cultural milieu of art world centres such as Paris and London. In Child and White Dog by a Pond, as in the Nebuchadnezzar series, the bush becomes an anxious, claustrophobic space. This is expressed in its dark tonality that consumes much of the composition. The blackened tree branches stripped of vegetation immediately call to mind a bushfire charred Australian landscape. Into this setting Boyd introduces a symbol of innocence in the form of a small child illuminated in white. Towards the child a ghostly white dog appears to be leap into the scene with its front legs outstretched. In this work and many others created in the 1960s, Boyd draws upon a cast of personal symbols. Boyd’s expressionist approach is summed up by Ursula Hoff, where the ‘manner and execution conveys states of feeling; distortion, illogical, spatial relations and idiosyncratic handling serve to convey the intense involvement of the painter with his theme.’2 Motifs that receive this treatment include the form of the ‘child-spy’ that appears in the present work. Boyd has made its presence felt in other works from this period, such as the painting Lovers in a Boat 1961 that formed the core of his important retrospective exhibition at London’s Whitechapel Gallery in 1962. In this work and others, Boyd continues his improvisation upon repeated motifs to evoke both innocence and existential angst. As in many of Boyd’s paintings particularly of this period, it is dreamlike, irrational, and avoids a direct narrative. Yet the painting resonates with tacit meaning that reveals itself over time and prolonged engagement.